Personal stuff of very little interest to anybody. But The Inn has been looking rather untended lately, so herewith. . . .
Well, it's been a quiet week at The Inn. At least so far as posting here goes. Herself took the week off as vacation. She's been in a tidying up mood all week which has interfered with the quiet contemplation required for all the deep thoughts you usually read here. Ahem. That, and we went out to eat almost every day, which requires more than just eating, but also ambling about the neighbourhood and poking around in nearby shops. And now the Foot Physician, the metatarsal medico, is displeased with my progress. As, indeed, am I. But he has put me back in that #$%!£! boot/brace for a couple more weeks. So I shall be playing for a funeral in it tomorrow, no processing or recessing required, laus sit Deo. 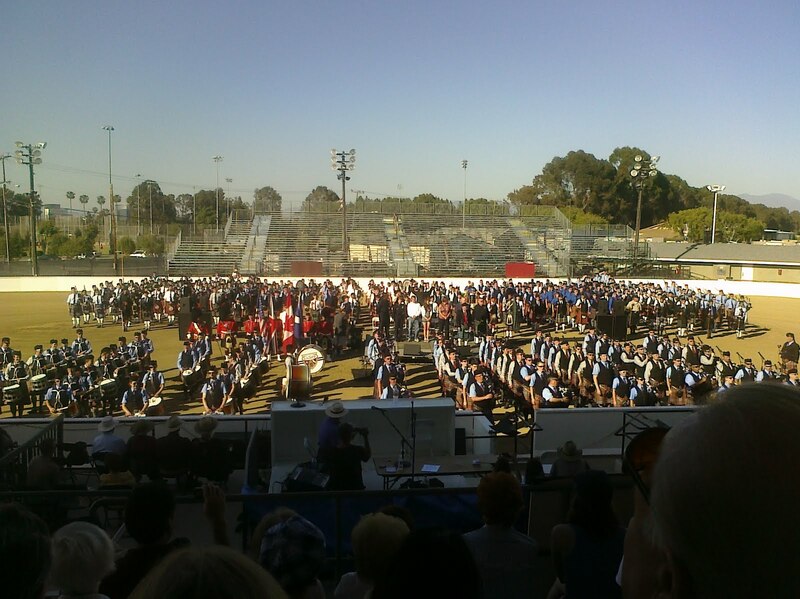 And the rest of the weekend I'll be stumping and limping about the Costa Mesa Highland Games, trying to catch all the piping, some of the dancing, and trying to keep appointments with all the people I've promised to meet up with. (Did I just end a sentence with two prepositions?) Oh, yes, and trying to tick off all the items on my shopping list in the vendors' booths. If you're in the neighbourhood, this will point you in the right direction. I should be relatively easy to find. And extremely easy to catch. An historical curiosity this morning. If you play the little video on this page, you will hear some Flemish bagpipes playing at the Dunkirk commemorations. Wikipedia says that Dunkirk is in a traditionally Flemish part of France, even though French has now almost completely replaced the Flemish language. 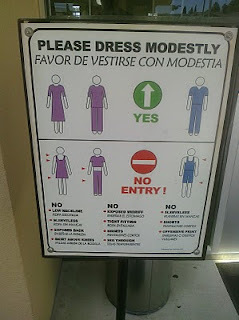 "Let all men see your modesty. . ."
So says one of the Sunday epistles in what seems to be almost an oxymoron. 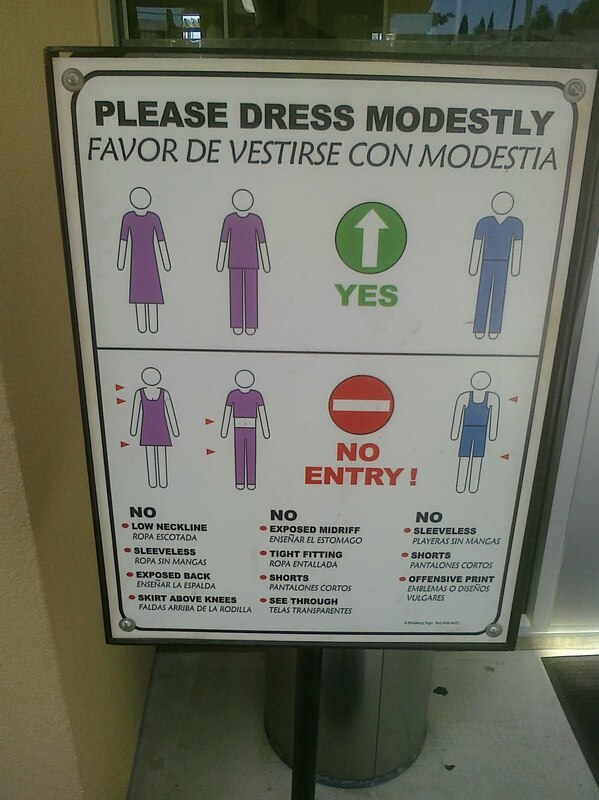 But this sign refers to a different sort of modesty. It appears by each door of one of our local churches. This weekend's piping is courtesy of Molly's blog The Thousandth Time. A few days ago she posted this link to The National Piping Centre which has put up several samples of traditional music of the American south with piping accompaniment. Most of the pipes are Scottish small pipes and border pipes with a couple of Highland pipe pieces. The page of samples is. . . .
. . . an online supplement to the Mountain Piping feature in issue 45 of Piping Today magazine. The feature gives an insight to the musical and historical traditions of American old-time music and the influence of pipe music on the tradition. Written by Timothy Cummings, author of An Appalachian Collection, he explores the growing interest many American pipers are showing in playing old-time music and playing along with other old-time musicians. The material and links below will give you further points of reference and examples of tunes and music to take your interest further. I must down to the sea again, to the lonely sea and sky. . . So. What's with all the pictures of nothing in particular. Water is nice, but is there a point? Well, no, not really. I was sorting out the "Picture" file this morning, trying to put a bit of order into all those shots that were just dumped out of the camera to be got to later. These are just some odds and ends from same. I confess they won't mean much to you but they remind me of good things. That little sparrow in the picture below, for instance, was a fascinating little beggar. Absolutely fearless. And a greedy little glutton, hogging more bread than he could possibly deal with. He would on no occasion share with his more skittish brethren. He must have been a trial in his kindergarten class. This one doesn't appear to be in vows either and is satisfied with bits of bread from a BLT. It's almost midnight here in the lower left-hand corner of the California Republic. But we still have about thirty minutes left of what the Carmelite calendar tells us is the feast of St Simon Stock. St Simon is sometimes listed as Simon Anglicus or Simon the Englishman. The Inn is very fond of St Simon; his feast has been commemorated a few times before. You can find some of the posts here, here, here, and here. The illustration at the top shows St Simon wearing the original striped cloak of the Carmelites while receiving the scapular from Our Lady. May thy people dedicated to Thee and the Virgin and Mother, O Lord, always rejoice in the solemnity of Blessed Simon, whom Thou didst give to them as ruler and father; and as through him they received such a sign of protection, so they may enjoy the gift of eternal predestination. Through our Lord. Amen. The celebrant and preacher was Fr Oppenheimer, prior of the Canons of the New Jerusalem. The canons are a tiny order but they make up in holiness what they lack in numbers. And Fr Oppenheimer gives a gripping sermon. The words "Great Apostasy" occurred last night. In the interrogative, to be sure, but when did you last hear them in a sermon? The Cantores Sancti Augustini mentioned in the flyer are a 4 voice schola - not just a four-part schola, but literally four people: SATB, one each. And they were a delight. (The alto was fighting a chest cold and deserves a medal or something for a fine performance under very adverse circumstances indeed.) 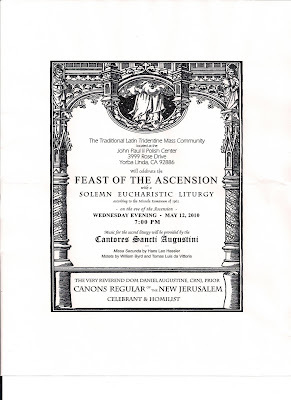 They sang the ordinary parts and several motets and the CNJ schola sang the Gregorian propers. It was a long Mass - a nickel's change from two hours - but not a moment too long. I'm still raised slightly off the ground this morning. 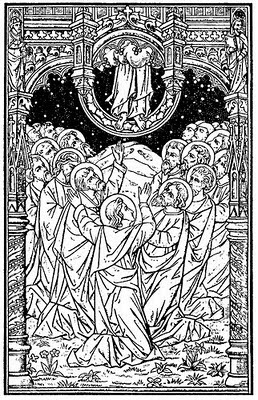 Today is the last of the thee rogation days preceding Ascension Thursday. Recta Ratio reprints a little article here from Father Francis X. Weiser, SJ's Handbook Of Christian Feasts and Customs. All you'll ever need to know about Rogation Days. "Absentmindedness in a Parish Choir"
It happened on Sunday after Christmas the last Sunday they ever played in Longpuddle church gallery, as it turned out, though they didn't know it then. The players formed a very good band almost as good as the Mellstock parish players that were led by the Dewys; and that's saying a great deal. There was Nicholas Puddingcome, the leader, with the first fiddle; there was Timothy Thomas, the bass-viol man; John Biles, the tenor fiddler; Dan'l Hornhead, with the serpent; Robert Dowdle, with the clarionet; and Mr. Nicks, with the oboe all sound and powerful musicians, and strong-winded men they that blowed. For that reason they were very much in demand Christmas week for little reels and dancing-parties; for they could turn a jig or a hornpipe out of hand as well as ever they could turn out a psalm, and perhaps better, not to speak irreverent. In short, one half-hour they could be playing a Christmas carol in the squire's hall to the ladies and gentlemen, and drinking tea and coffee with 'em as modest as saints; and the next, at the Tinker's Arms, blazing away like wild horses with the "Dashing White Sergeant" to nine couple of dancers and more, and swallowing rum-and-cider hot as flame. Well, this Christmas they'd been out to one rattling randy after another every night, and had got next to no sleep at all. Then came the Sunday after Christmas, their fatal day. 'Twas so mortal cold that year that they could hardly sit in the gallery; for though the congregation down in the body of the church had a stove to keep off the frost, the players in the gallery had nothing at all. So Nicholas said at morning service, when 'twas freezing an inch an hour, "Please the Lord I won't stand this numbing weather no longer; this afternoon we'll have something in our insides to make us warm if it cost a king's ransom." So he brought a gallon of hot brandy and beer, ready mixed, to church with him in the afternoon, and by keeping the jar well wrapped up in Timothy Thomas's bass-viol bag it kept drinkably warm till they wanted it, which was just a thimbleful in the Absolution, and another after the Creed, and the remainder at the beginning o' the sermon. When they'd had the last pull they felt quite comfortable and warm, and as the sermon went on most unfortunately for 'em it was a long one that afternoon they fell asleep, every man jack of 'em; and there they slept on as sound as rocks. 'Twas a very dark afternoon, and by the end of the sermon all you could see of the inside of the church were the pa'son's two candles alongside of him in the pulpit, and his spaking face behind 'em. The sermon being ended at last, the pa'son gie'd out the Evening Hymn. But no choir set about sounding up the tune, and the people began to turn their heads to learn the reason why, and then Levi Limpet, a boy who sat in the gallery, nudged Timothy and Nicholas, and said, "Begin! Begin!" "Hey, what?" says Nicholas, starting up; and the church being so dark and his head so muddled he thought he was at the party they had played at all the night before, and away he went, bow and fiddle, at "The Devil among the Tailors," the favorite jig of our neighborhood at that time. 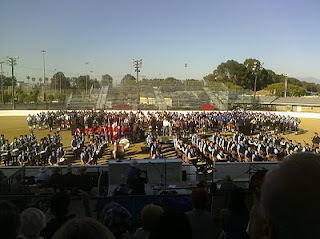 The rest of the band, being in the same state of mind and nothing doubting, followed their leader with all their strength, according to custom. They poured out that there tune till the lower bass notes of "The Devil among the Tailors" made the cobwebs in the roof shiver like ghosts; then Nicholas, seeing nobody moved, shouted out as he scraped (in his usual commanding way at dances when the folk didn't know the figures), "Top couples cross hands! And when I make the fiddle squeak at the end, every man kiss his pardner under the mistletow!" The boy Levi was so frightened that he bolted down the gallery stairs and out homeward like lightning. The pa'son's hair fairly stood on end when he heard the evil tune raging through the church; and thinking the choir had gone crazy, he held up his hand and said: "Stop, stop, stop! Stop, stop! What's this?" But they didn't hear 'n for the noise of their own playing, and the more he called the louder they played. Then the folks came out of their pews, wondering down to the ground, and saying: "What do they mean by such a wickedness? We shall be consumed like Sodom and Gomorrah!" Then the squire came out of his pew lined wi' green baize, where lots of lords and ladies visiting at the house were worshipping along with him, and went and stood in front of the gallery, and shook his fist in the musicians' faces, saying, "What! In this reverent edifice! What!" And at last they heard 'n through their playing, and stopped. "Never such an insulting, disgraceful thing never!" says the squire, who couldn't rule his passion. "Never!" says the pa'son, who had come down and stood beside him. "Not if the angels of Heaven" says the squire, (he was a wickedish man, the squire was, though now for once he happened to be on the Lord's side) "not if the angels of Heaven come down," he says, "shall one of you villanous players ever sound a note in this church again; for the insult to me, and my family, and my visitors, and God Almighty, that you've a perpetrated this afternoon!" Then the unfortunate church band came to their senses, and remembered where they were; and 'twas a sight to see Nicholas Puddingcome and Timothy Thomas and John Biles creep down the gallery stairs with their fiddles under their arms, and poor Dan'l Hornhead with his serpent, and Robert Dowdle with his clarionet all looking as little as ninepins; and out they went. The pa'son might have forgie'd 'em when he learned the truth o't, but the squire would not. That very week he sent for a barrel-organ that would play two-and-twenty new psalm tunes, so exact and particular that, however sinful inclined you was, you could play nothing but psalm tunes whatsomever. He had a really respectable man to turn the winch, and the old players played no more. We suspect that in this year of our Lord 2010, there are some parishes in which, aside from the improvement, the little mishap might not have been noticed. I probably shouldn't read these things over breakfast. It's too early in the morning, everything's still fresh and new and I get overly enthusiastic. I may gush. I do gush. Probably shouldn't. But this is brilliant. It's the lead article in the latest number of The American Conservative. The author writes from a British context but he describes our disintegrated society to a T.
This is a concise and neatly described analysis of the destruction wrought by the two principal ideological tendencies in the English-speaking west. That is, two ideological tendencies which feed off each other and both exacerbate the problems they claim to remedy. The 1960s New Left, to counter the authoritarian state it created, built a personal zone free of control in which to repudiate all standards and sell the poisonous idea of liberation through chemical and sexual experimentation. But when these New Left individualists preached personal pleasure as a means of public salvation, they were not resisting state control. They were, through their demands for freedom without limit and life without responsibility, undermining all autonomous self-governing structures, leaving a dreadful legacy of anarchic individualism that required state authoritarianism as the only way to re-impose order and society. Contemporary libertarian individualism and statist collectivism created each other and are locked in a fatal embrace that destroys the civic middle and the life and economy of the associative citizen. This whole scenario dawned on me when I realized that my left-wing friends didn’t really believe in community. They only believed in choice. They supported abortion because they found it validating, a demonstration of real personal autonomy. But they think that fox hunting is terribly cruel and so should be ardently opposed. No doubt the same dispensation finds similar expression in the United States. The Left harbors a deep and abiding hatred of fixity and tradition, a loathing of anything settled. In Anthony Giddens’s Third Way—the book that was behind the Blair revolution in Britain—he talks about how a new cosmopolitanism will free people from nature, and one gets the sense that Cool Britannia so envisaged is the permanent destruction of taboo and tie. According to the Blairite radicals we have to constantly rewrite ourselves by a willful assertion that wipes the slate clean and lets us begin again through the permanent act of choice—as long as such volition shows no teleology or direction. Nobody is told what to choose because the moral act in our contemporary paradigm isn’t what is chosen, it’s the act of choosing itself. Indeed, to choose is to repristinate and repeat the idea of oneself as an isolated, atomistic agent. Phillip Blond's book is going on the want-list immediately. Lots of Carmelite references this week. This one is a video showing a celebration of solemn Mass in the Carmelites' old Jerusalem Liturgy of the Holy Sepulchre. The celebration takes place at Aylesford Priory in Kent, which has a fascinating history of its own. The introduction to the first video will tell you something of it. It was one of the first, if not the first, of the medieval English priories; St Simon Stock of scapular fame lived there. Four centuries after dissolution at the hands of Henry VIII it is back in the hands of the Carmelite Order. There are eight videos in the series going to make up the entire Mass, thanks to YouTube's 10 minute limitation on any one video. The "playlist" feature should enable this one "embed" to run the whole series of 8 videos without you having to search for the succeeding ones. Don't know if it works yet. If not, the search should be pretty easy. I tried to make out Brocard Sewell amongst the friars but haven't been able to yet. He should have been there at that time. Sewell knew Chesterton and Belloc and many other of the greats of the Distributist movment and wrote the only reliable - if necessarily sketchy - biography of Montague Summers. The video was posted about a year ago by the folks at the New Liturgical Movement blog. We are in their debt. Paddy Keenan on the union pipes with some friends going at it with a few jigs and reels. 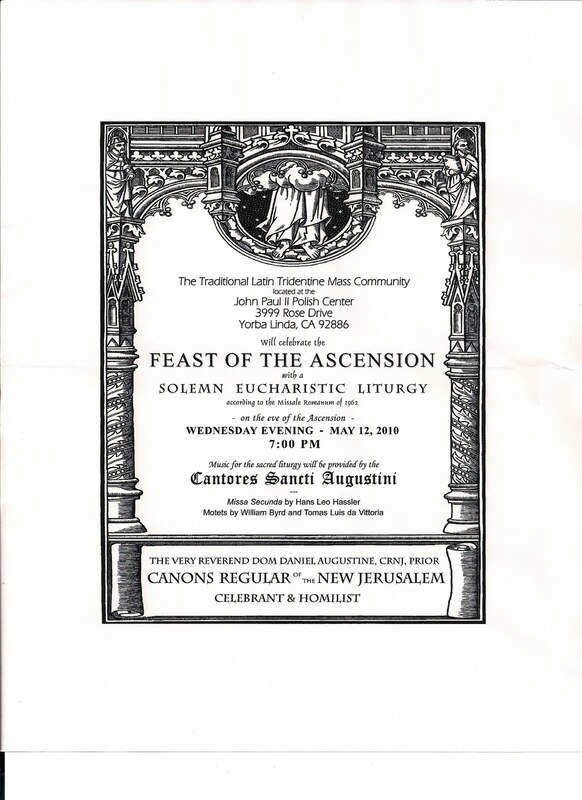 Tell ya 'nother thing about Santa Catalina Island: the first Mass celebrated on the island was celebrated by Discalced Carmelite Friars, Fray Antonio de la Ascencion and Fray Andres de la Asuncion. Fray Tomás de Aquino was present but apparently too ill to celebrate. According to the plaque it was celebrated on the same day on which Herself was born. (In their respective centuries, of course.) But, alas, the documentation seems to indicate that the Mass was four days earlier. 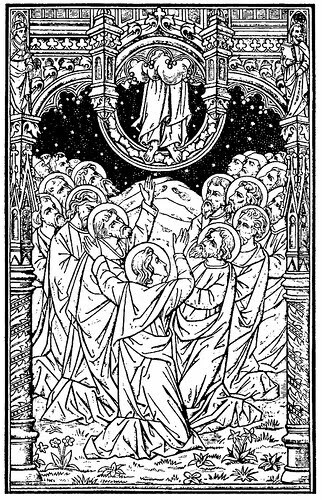 The plaque shown above - which if you click on it will expand to enormous dimensions - is based on an icon written by Bro. Claude Lane, O.S.B. It can be seen just to the left of the front door of the island's parish church dedicated to St Catherine of Alexandria. It appears to be a glazed terra cotta representation of the icon and shows what would have been the Mass as codified by Pope St Pius V, the Discalced by that time having left the old Jerusalem Liturgy of the Holy Sepulchre for Pius' Missale Romanum. Vizcaíno got two large boats and a tender and left Acapulco on May 5, 1602, under the protection of Our Lady of Mount Carmel. The Franciscans wanted to be chaplains on the expedition. However Fr Eliseo of the Martyrs was confessor to the viceroy, and so we got the job. The Carmelite chaplains were to be confessors and to administer the sacraments. They were also to watch out for future opportunities for evangelization. We may look on General Vizcaíno as a real estate developer -- hoping to open up ports and become a rich man. He was jealous of Cabrillo (1542); and so on this expedition, Vizcaíno renamed all the places along California -- names that last to this day. The friars were zealous men, true missionaries, hoping eventually at a later date to bring the Gospel to the Indians. Today is the feast of the Blessed John Haile, vicar of Isleworth and one of the 40 English martyrs, one of the first group of martyrs under the Tudors. This text is from Parish Priests Among Saints: Canonized or Beatified Parish Priests by the Dominican priest, Fr Walter Gumbley, published in the early part of the last century. Blessed John Haile, martyred under Henry VIII on May 4, 1535, was solemnly beatified by Pope Leo XIII on December 29, 1886. He had long been a priest having, it is stated, been nominated parish priest of Chelmsford as far back as 1492. Thirty-one years later he was presented to the parish of Isleworth, then called Thistleworth, in Middlesex, on August 13, 1521. When Henry VIII openly took his mistress Anne Boleyn as his legal wife, and had her crowned queen, John Haile -- he is sometimes called Hale or Hall -- spoke his mind on the matter in no measured terms to his companions. But in those days of tyranny few confidants could be trusted. Even professed friends were often private enemies and paid spies. In some way the knowledge of the old parish priest's indignation reached government circles, and he was marked down to form one of the first band of priests and religious with whom Henry determined to make a bloody example to the whole realm. He was accordingly arrested early in 1535 and at the end of April condemned to die a traitor's death in company with four others, namely, three Carthusian priors, Blessed John Houghton of London, Blessed Augustine Webster of Axholme in Lincolnshire, and Blessed Robert Lawrence of Beauvale in Nottinghamshire, and the Bridgettine monk of Sion, Blessed Richard Reynolds. These glorious protomartyrs of the English persecutions, were dragged on hurdles to Tyburn Tree and put to death with all the abominable atrocities which attended the English legal punishment of treason. It was thus that the parish clergy supplied the most venerable of these five martyrs in the person of Blessed John Haile who must have been in his seventieth year or more. 26 Miles Across the Sea. . . . There are lebenty leben million shots of the casino on Santa Catalina Island. This is one of them. That's where we were over the weekend and that's why The Inn looked abandoned. The southern California branches of the RSCDS sponsored a weekend of classes and dances on the island and herself and I enjoyed ourselves rather a lot. Alas, she did the dancing. I mostly hobbled. But the music was outstanding and the weekend well-worth attending, even for those of us with a wonky left foot (though no longer in a boot-brace I'm delighted to say). Did manage to lead the Grand March with Bill H. on snare from the center of town out to the casino. But only just. It was a long blow and a long walk which the wonky foot did not appreciate. Three quarters of a mile perhaps? And up four or six steep ramps - I forget; it seemed like ten - and into the main ballroom. About three minutes after that last shot was taken of us playing into the casino porch, the lungs and the foot both gave out, I played Flowers of the Forest for myself, raised the white flag of surrender, and sat down with the proffered libation. Followed by dinner, conversation, music, and for some, dance. Wonderful evening, once I got my breath back. [Post scriptum: For those who worry about such things, the word "casino" does not necessarily imply gambling, which so far as I know, doesn't occur there any more. From the fons scientiæ cunctæ, Wikipedia: "The term 'Casino' is of Italian origin, the root word being "Casa" (house) and originally meant a small country villa, summerhouse or pavilion. The word changed to refer to a building built for pleasure, usually on the grounds of a larger Italian villa or palazzo. Such buildings were used to host civic town functions – including dancing, music listening and gambling."